The buffalo thorn (Ziziphus mucronata Willd.) is a multipurpose tree whose leaves and fruits are a valuable fodder source. 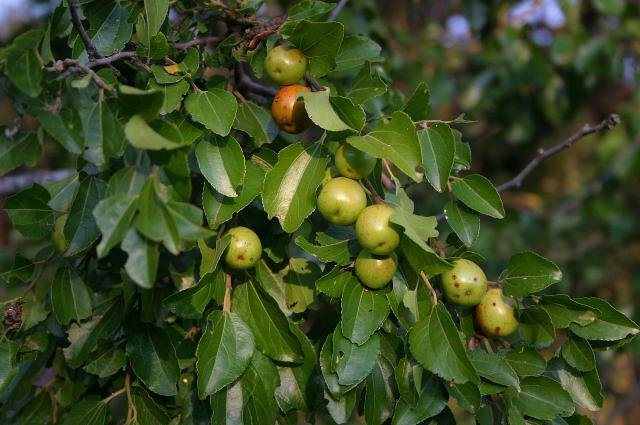 The buffalo thorn (Ziziphus mucronata Willd.) is a small to medium sized tree, growing to a height of 3-10 (-20) m. The crown is irregular, with dense spreading and drooping branches. The trunk is short, up to 40 cm in diameter, branching near the base, with a grey-brown bark. The branches are armed with pairs of sharp thorns (0.7-2 cm) on each node. The leaves are simple, alternate and very variable in size (3-9 cm long x 2-5 cm broad), glossy green on the upper side and paler below. 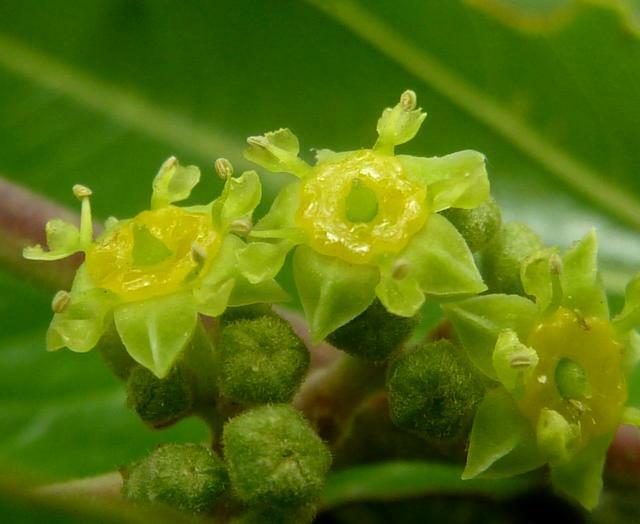 The flowers are small (4 mm), green to yellow, borne in clusters. The flowering period depends on rainfall and can start from October to late summer (January). The tree bears numerous fruits, the weight of which often bends the branches. The fruits are small, between 10 and 20 (-25) mm. They are globose, glossy drupes that turn from green to dark brown as they ripen in late summer (January) or later in winter. They have a hard, shiny exocarp and a floury, nutritious mesocarp. The oval seed is usually solitary and embedded in a hard stone (Orwa et al., 2009; Mazibuko, 2007; Ellis, 2003). 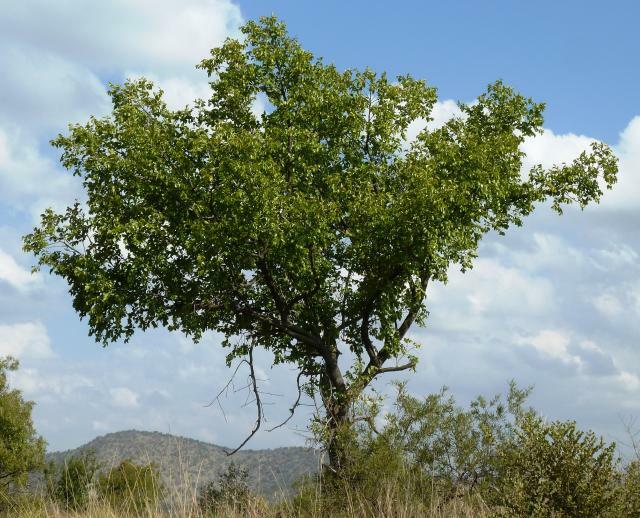 The buffalo thorn is a multipurpose tree of considerable cultural importance in Eastern and Southern Africa, and many beliefs and traditions are attached to it (Mazibuko, 2007). Its Zulu name umLahlankosi means "which buries the chief". In Botswana, the tree is believed to protect from lightning (Mazibuko, 2007). The fruits are edible and nutritious though not very tasty and somewhat mealy. In times of scarcity, they can be eaten fresh, dried or made into a meal or porridge. The fruit flesh mixed with water is a good thirst quencher and is fermented to prepare a beer (Roodt, 1998 cited by Ellis, 2003). The young leaves are not very palatable but are nutritious and can be prepared in the same manner as spinach. Roasted seeds can be used as maize meal or as coffee substitute. The wood is used for fuel, agricultural implements and utensils. The thorny branches are used for fences. The sap is used as a mixing agent for arrow poison and, because of its high tannin content (12-15%), the bark helps in tanning leather. The buffalo thorn is used as an ornamental in gardens (Orwa et al., 2009). Many parts of the plant are used in ethnomedicine. Tannins may play a role in the treatment of dysentery (Ellis, 2003). In East Africa, roots are used for treating snake bites (Hutchings et al., 1996 cited by Mazibuko, 2007). These properties have been attributed to the peptide alkaloids and antifungal properties isolated from the bark and leaves (Mazibuko, 2007). The leaves and fruits are a valuable fodder source for livestock and game (Orwa et al., 2009). The buffalo thorn is widespread in Southern and Eastern Africa. It occurs in South Africa, Botswana, Namibia and Mozambique, as well as Ethiopia and Arabia. It is found in arid and semi-arid areas dominated by thorny vegetation such as dry savannah woodlands, open scrublands, open grasslands, forest margins and riverine vegetation. The buffalo thorn is a very hardy species able to withstand frost and drought. Ziziphus mucronata is found from sea level up to an altitude of 2000 m. It is tolerant of coastal salt spray. It grows on a wide range of soils, from shallow rocky hillsides to brackish floodplains along rivers, but does better on deep alluvial soils near water where it can form dense thickets. It is believed to indicate underground water (Ecocrop, 2014; Orwa et al., 2009). The buffalo thorn is a valuable feed resource for wild animal species. Its fruits are relished by birds, baboons, monkeys, warthogs, bushpigs (Potamochoerus larvatus), etc. Its leaves are sought after by giraffes, elephants, black rhinos, kudus (Tragelaphus spp. ), nyalas (Tragelaphus angasii) and impalas (Aepyceros melampus). The nectar is particularly attractive to bees (Orwa et al., 2009; Mazibuko, 2007). Buffalo thorn forage has a medium to high protein content (10-20% DM) and a moderate fibre content (ADF 17-23% DM). It is considered as a potential protein supplement in low-grade forage diets. The Ca, P, Mg, Na and K contents are variable but higher than cattle requirements (Njidda, 2012). Buffalo thorn forage has a medium protein content and a moderate fibre content. It can be used as protein source in low-grade diets fed to ruminants. It ranked among the most nutritious forage trees assessed in Kenya (Ondiek et al., 2010a). Buffalo thorn forage is palatable to livestock, and more palatable to goats than to sheep (Osuga et al., 2008). Buffalo thorn foliage has medium to high in vitro OM and DM digestibility (values ranging from 55 to 75%) (Ondiek et al., 2010a; Njidda et al., 2010; Hassen et al., 2009). In North-eastern Nigeria, buffalo thorn fodder was found to have a higher ME content (6.2 MJ/kg DM, assessed by gas production) than other forage tree species including Leucaena leucocephala, Acacia tortilis and Moringa oleifera (Njidda et al., 2010). In Kenya, small East African goats offered a low-grade hay-based diet were supplemented with buffalo thorn forage alone (15% or 30% of the diet DMl) or in a mixture with forage from the Maerua angolensis tree (Osuga et al., 2012; Ondiek et al., 2010b). The supplemented diet had a higher protein digestibility and the goats increased DM intake, N intake and N retention (Osuga et al., 2012). Buffalo thorn forage fed at 20 g DM/kg W0.75, supplementing Chloris gayana, resulted in 34 g/day weight gain (Ondiek et al., 2011). Mazibuko, N., 2007. Ziziphus mucronata Willd.. South African National Biodiversity Institute (SANBI).